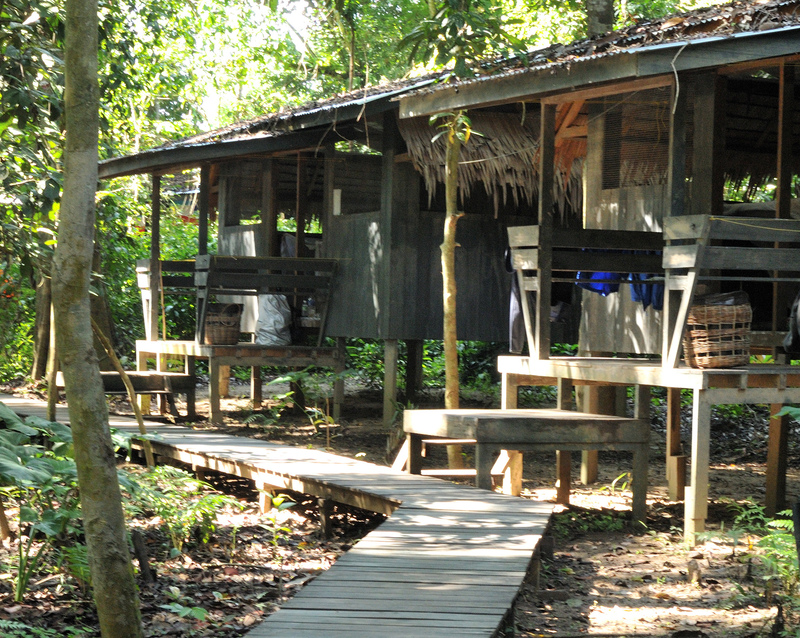 The Camp is on a Native Land along the Kinabatangan, near the Lokan River, a tributary of the Kinabatangan. As with many plots of Native Land in the Kinabatangan, our site remains uncleared of its jungle. Our location is remote and is located between the Forest Reserve and Wildlife Sanctuary. Wildlife is present in abundance. If it is a Tropical Rain Forest you want to experience, then Uncle Tan’s Wildlife Camp is the place you want to visit. We do however wish to remind visitors that set in such a natural environment facilities are not of a FIVE STAR Resort & SPA and are in fact Spartan in nature - but we do our best under "circumstances of wilderness" to make your visit enjoyable and comfortable. You will get plenty of attention, hospitality and wildlife to observe. And… you will have plenty of good food. Yes, we will feed you well! We would like to remind visitors that at Camp, facilities are Spartan in nature, but we do our best under “circumstances of wilderness” to make your visit enjoyable and comfortable. Staying at Uncle Tan’s Wildlife Camp is a roughing out experience! 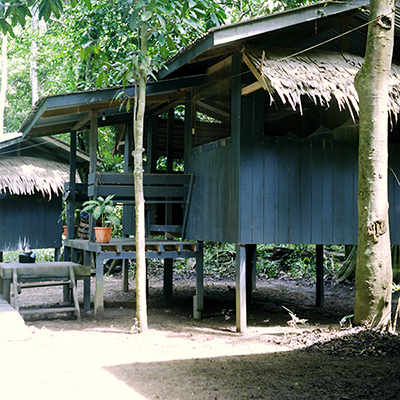 The Camp is located in the Lower Kinabatangan Flood Plains – a Wetland and a Rain Forest. Floods can occur in a Flood Plain. Often, it rains in a Rain Forest and a Wetland isn’t exactly dry. Experience the Kinabatangan on its own terms! Accommodation at Camp is in the form of raised huts. What we have are rough huts. We do not have villas, lodges, chalets or the likes. You will have a light mattress and mosquito net. All huts are on sharing basis. Make sure you collect a clean sheet from our Ops Base before heading for the Camp. All meals are cooked for you. These include breakfast, lunch, afternoon tea and dinner. Meals are to set menus. You can have a morning cup of coffee/tea before the start of the morning safari. Breakfast is at 8:00 a.m. Lunch is at 12:30 noon and afternoon tea is at 3:30 p.m. Dinner will be prepared by 8:00 p.m.
We bring in water for cooking and making tea and coffee. Hot water for making drinks is available. Feel free to ask the kitchen staff for some when you want to make a hot drink. Bottled drinking water is sold by our staff co-operative. Tea and coffee are available all day. If you find the containers on the serving table empty, do ask our Camp staff to make more. Water for bathing and washing is pumped from the lake to the bathhouse. Make use of the bathhouse for cleaning up. Try to conserve water. DO NOT SWIM OR WASH IN THE RIVER! Big crocodiles have been spotted on River Safaris. Crocodiles have been seen taking wild pigs during River Safaris. Q: I am a vegetarian. Would that be a problem? A: When you arrive, let our staff know. They’ll be happy to accommodate. We are used to catering for vegetarians. Q: I am on gluten free diet and will be bringing my own food. Can I use the Camp’s kitchen to prepare my food? A: Feel free to use our Camp kitchen. Our staff have been generally briefed about gluten free diet and will be happy to assist you to prepare your meals. However, their understanding are limited. It would be best that they assist under your supervision. Q: Do crocodiles come to the Camp area? A: We have never encountered any incident where the croc came and toured the Camp area. Mistakenly, visitors sometimes exclaim that they have seen crocodiles in the Camp area [and that can cause quite a buzz]. But what they saw were monitor lizards. Many young visitors said they saw Dinosaurs. At Camp, our staff co-operative sells canned drinks and bottled drinking water. Rubber boots are also available for rent. Income earned by the staff co-operative goes to the staff. The company takes no commission or percentage from the co-operative. The co-operative is the staff’s little business that the company allows them to conduct. Please remember to settle your bill before leaving Camp. Note: It is a tough task for the staff to carry bottled water and drinks to the Camp. To ensure that there is enough bottled water for all, visitors are requested not to waste drinking water. It would be a good idea to mark your bottle of water so that it won’t get mixed up with others and eventually gets discarded due to confused ownership. Using drinking water for shower is not a considerate thing to do. As part of our activities, we conduct a guided trek in the surrounding jungle area. All trekking would be guided. Trekking without a guide is not allowed. This is because due to little use, trails may not be clear and are unmarked. There is a risk of getting lost in the jungle. Many visitors come with cameras that need recharging. We use a small generator for lighting and charging of batteries from 7.00 p.m. till midnight. Throughout Malaysia, the Standard British 3-pin-plug is used. The 2 pins can also be used but use of this without the earth connection with risky items (such as iron, shaver, etc) should be avoided. Voltage is 220/230 Volts. If your appliance is rated for 110 Volts as is common in the U.S., you would require a step-down adapter. It would be best to bring the adapter if it is the case, as this can be difficult to purchase locally. Avoid putting food in the huts especially in your pack - rats and squirrels will bite through your pack to get at the food. Rodents also love aspirin, paracetamol and toothpaste. Visitors are reminded to keep their belongings safely! Our boats are open skiffs and are used to transfer people to and from Camp and to conduct river safaris. On no account should visitors request the boats to go out to the village to buy things or drive them without permission. The transfer boat leaves the Camp only once a day, departing at about 10:00 a.m. The boat going to Camp will leave the jetty at about 4:30 p.m.
Life vests MUST be worn on board. Do not sit on the side of the boat. Do not stand up while the boat is moving. If you need to stand up to take a picture, switch places or get your things, put your hand up to get the Boatman’s attention and ask him to stop the Boat. Do not block the view of the boatman. You are advised to bring along the medication you use. If you are sick, inform the Camp staff. If need be, arrangements will be made to take you out of the Camp immediately for you to get medical attention. The most common sickness at Camp is dehydration. We see many such cases, especially affecting children. This is because our weather is hot and humid. A lot of water is lost especially when there is physical assertion. It will be good to ensure that plenty of water is consumed. Avoid bringing strong intoxicating drinks into Camp. It would not be nice when someone gets drunk and spoils the holiday for others. Beer is permissible. NEVER do illicit drugs at our premises/Camp or bring any illegal substances to our premises/Camp/vehicles/boats. We have zero tolerance for drug abuse. Get to know our staff and guides. Be their friend and they will be your buddies and companions - they know the jungle and river very well and will have a lot to share with you. Our guides are committed to their jobs. Tell them your special interest and they’ll be happy to point things out to you. Night trek (9:00 p.m. 1 hr, Day 2). In the morning before you leave Camp, if there is extra room in the boat, visitors who stay longer than a day can go out for another River Safari. Please give those who have not gone on any Safari a chance. The 2D1N trip is a shorter version of the 3D/2N itinerary. With the 2D/1N trip, you will do a night boat ride on the day you arrive Camp and a morning boat ride the next day. After breakfast, you will leave the Camp at 10 a.m. In the rare event that extreme weather and fast river current are experienced, taking safety into account, the Camp Chief or Head Boatman may in his best discretion cancel any program or make adjustment to the timing of the program. At no point must visitors challenge or contradict the decision. Before leaving for/from Camp/Ferry site/Ops Base, please ensure that you have your luggage and belongings with you and that they are in the Vehicle/Boat. It is quite a distance from one point to the other and it will take time (and lots of arrangements) for us to assist you to get your left items. Do not ask others to remember to “put this in” or “take that out”. We are proud owners of our worldly possessions and have the wonderful honour of taking care of our own things. We do not have a dishonesty problem at Camp. However, unfortunately, there have been a few cases where our staff and other visitors have been wrongly accused (the presumed “stolen” items were found not to be missing or simply misplaced or accidentally thrown into the garbage). It is not nice when someone jumps to conclusion and wrongly accuses others. The person may eventually apologise but the damage to the one being accused would have been done. We now ask that visitor deposit their valuable, important documents and spare money with our staff in-charge at Ops Base/Camp for safekeeping. This measure has been taken to prevent possible false accusations and suspicions that can cause a lot of unpleasantness. Q: Do I need to take my wallet and money with me when I go out on Safaris and treks? A: There are no shops nearby the Camp or in the surrounding jungle area. Credit cards are completely useless in the jungle. There is no need to take your wallet and money with you when you go out on Safaris and treks. Arrangement to go to the Wildlife Camp is made only at our Operation Base. Unregistered visitors arriving themselves to the Camp will not be entertained and will be treated as trespassers. We do not have any “transportation” or other agents to bring visitors directly to Camp. We control and carry out all arrangements to take visitors to Camp. As the Camp is very popular with visitors, kindly adhere to your departure dates. You may extend your days in the camp only if space is available. Call: Ops Base at +(6) 089 – 675 784 or +(6) 016- 8244749 (WhatsApp). [Important Note: We DO NOT have agents who can book or take visitors to our Camp. 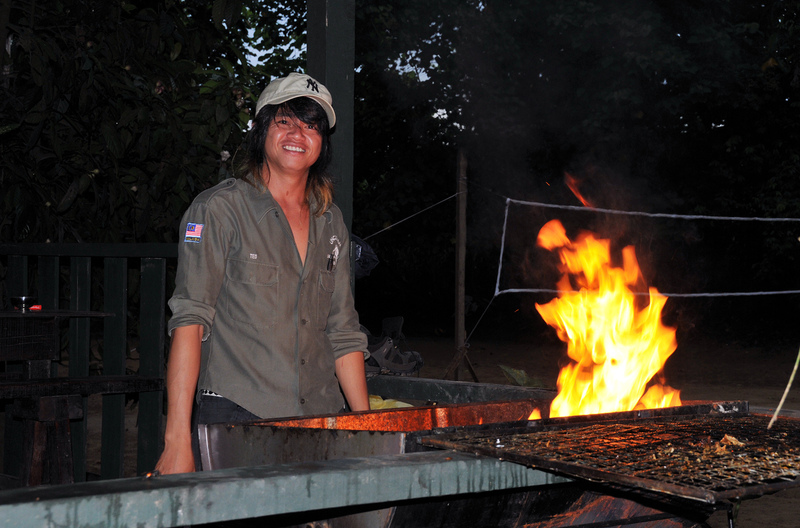 We handle bookings directly and we control and carry out all arrangements to take visitors to Camp. Please note that bookings can only be made via email, WhatsApp or calling our Ops Base. Q: Are children allowed to go to the Camp? Q: Can I leave my extra bags/luggage at the Ops Base while I go to the Camp? Note: No valuables, cash, travel documents, etc should be left in the backpack/luggage kept with us for storage. We will NOT entertain any complain regarding loss/damage of valuables, cash, etc. The Wildlife Camp is at the Kinabatangan River. Our Operations Base at Labuk Square, Mile 9, Labuk Road. These are 2 different places – quite apart in distance from each other. Visitors come to our Ops Base first. We then organise things and leave at 2:30 p.m. for the Kinabatangan river by van en route to Camp. At the river, our boats will then take visitors to Camp. The Camp will be your home during your stay. Make yourself at home. Loosen up and have fun! We conduct our business in a friendly way and lots of things are done as a matter of courtesy in friendship. Many business “advisers” tell us that this is not a good business approach. But we don’t care! This is our way. We are not calculative about tiny bits of this and that. Similarly, it would be really nice if we receive the same understanding and consideration in return. Enjoy your stay at the Camp. Since 1990, thousands have come to Uncle Tan’s to experience the adventure, nature and wildlife in the lower Kinabatangan valley. Many of these visitors have become friends, and have returned for second, third Visits.